As the two Koreas remain silent on the dates of the summit that is set to take place sometime in September, there is growing speculation that new developments may be unfolding in US-North Korea relations. On Monday, the two sides announced that President Moon Jae-in and North Korean leader Kim Jong-un would hold their third summit in Pyongyang following a ministerial meeting. However, Seoul and Pyongyang left the dates undeclared, revealing only that the meeting would take place in September and fueling speculation about North Korea’s intentions. While details remain undisclosed, it has been suggested that there may be new developments in US-North Korea denuclearization talks, which have so far failed to produce significant results since the June 12 summit between US President Donald Trump and North Korean leader Kim Jong-un. The latest speculation concerns the possibility of US Secretary of State Mike Pompeo making another trip to North Korea. Talk of Pompeo visiting Pyongyang surfaced last week when US National Security Adviser John Bolton revealed during a television interview that Trump had written to Kim offering to send Pompeo. According to Bolton, Trump made the offer in the letter to Kim that was presented to North Korean Foreign Minister Ri Yong-ho at the ASEAN Regional Forum last month. In Seoul, meanwhile, there is growing speculation that Pompeo might travel to Pyongyang as early as next week. While the South Korean government remains largely silent on the issue, a high-level government official denied reports that the North had invited Moon to its Sept. 9 Foundation Day celebrations. Earlier in the day, Rep. Park Jie-won of the minor opposition Party for Democracy and Peace speculated that Seoul might have received an invitation to the event from the North on Monday, but declined, and that the declined invitation might account for the dates of the summit being left open. In Monday’s talks, the North’s delegation was led by Ri Son-gwon, chairman of the Committee for the Peaceful Reunification of the Country, and the South’s by Unification Minister Cho Myoung-gyon. Following the meeting, Ri stated that Pyongyang had a set a date but that he was withholding that information. This fed even more speculation, much of it centering on the North’s displeasure at the slow pace of inter-Korean economic cooperation. Pyongyang has reverted to criticizing Seoul and Washington in recent months, accusing South Korea of relying excessively on the US and of attempting to avoid inter-Korean projects that require investment. The composition of the North’s delegation to Monday’s talks was a further source of speculation. 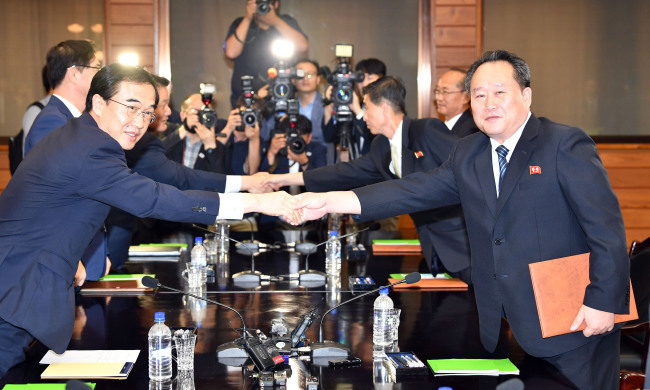 While the South’s delegation comprised officials from the Ministry of Unification and the National Security Office, the North’s included three officials representing organizations concerned with inter-Korean economic cooperation. Along with Ri and Vice Chairman of the Reunification Committee Pak Yong-il, those representing the North on Monday were Vice Railroad Minister Kim Yun-hyok, Vice Minister for Land and Environmental Protection Pak Ho-yong, and Pak Myong-chol, vice chairman of the National Economic Cooperation Committee.